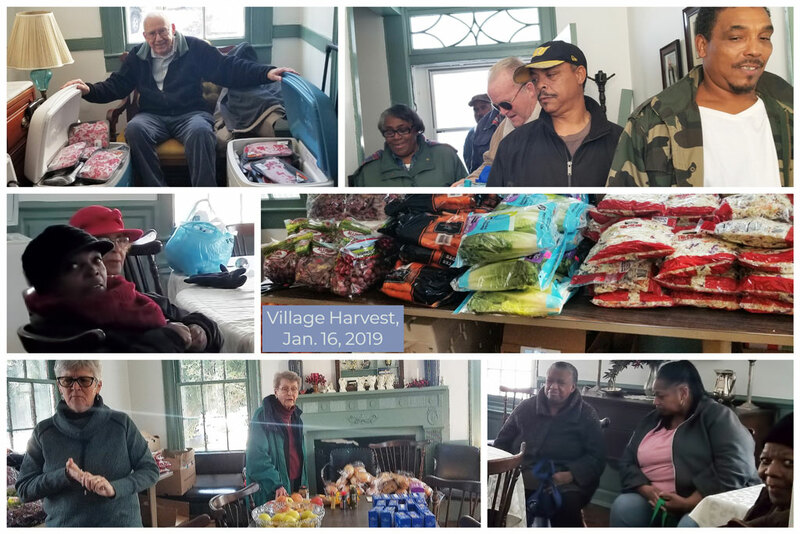 The first Village Harvest of 2019 brought 110 people on snow covered ground on Jan. 16. The snow was still around from Sunday when services were canceled. The number of shoppers was down from 140 in December but above 86 a year ago, Jan., 2018. It was slightly below the average for the last 12 months, 116. We had 1,226 pounds of food on hand with a larger percentage of meat. Produce comprised 57% of the harvest, meat 38% and bakery items 5%. It was the largest percentage of meat in a year. The total of 1,226 pounds was below the running 12 month average of 1,336 and the inventory of 2,044 pounds a year ago. It was 75% higher than December’s Harvest. We had 11 pounds of food per person to distribute and at $6 a pound represented a value just under $67 per person, just below the yearly average at $72.60. Thanks to Cookie and Johnny for their role in visiting the food bank, Andrea for her picture and Eunice, Clarence, Betty and Catherine for helping with the Harvest.